Jonathan R. Cole ’64, ’69 GSAS has spent nearly 50 years of his life at Col­umbia — arriving as a freshman in 1960 then quickly progressing to Ph.D. student (in sociology), professor, and eventually Provost and Dean of Faculties. 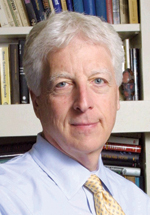 He currently is the John Mitchell Mason Professor of the University. “Some say I bleed Columbia blue,” he writes in the preface to his newest book. In the excerpt that follows, Cole explains why our research institutions are essential and how they have shaped our daily lives. Americans have always been fascinated with inventions and scientific discovery, and we pride ourselves on our ability to find solutions to formidable problems. Yet most people do not know the origin of the most important discoveries of our time. Is it any wonder, given that the bestselling twentieth-century American history high-school textbooks devote more space to Madonna than to Watson and Crick, that our top university professors and researchers typically miss out on even their fifteen minutes of fame? Nevertheless, we use products derived from ideas generated at our great research universities countless times a day — whether we realize it or not. For example, in the morning you may brush your teeth with an electric toothbrush, then stagger into the kitchen, open the refrigerator, and take out some orange juice. The toothbrush can vibrate thousands of times a minute, creating fluid dynamics that can dislodge bacteria and plaque much more efficiently than an old-fashioned toothbrush; the refrigerator has a compressed gas circulating through its coils; and the orange juice has been preserved while being shipped from a distant location. All three are based on discoveries made in university research departments. 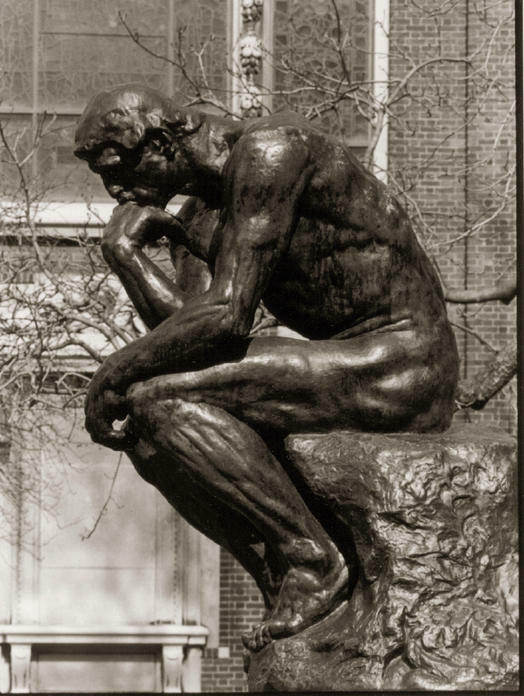 Contemplating that night’s dinner, you take some steaks out of the freezer and make sure you have the ingredients for a salad. Most likely, you are not thinking about the fact that the meat’s fine quality is a result of artificial insemination and scientific breeding techniques, both the result of university work, or that the special tomatoes on your counter have been genetically modified. You put a nice bottle of California wine into the fridge to chill, with nary a thought of the heartier vines made possible by research conducted by university enologists, then turn on your favorite FM radio station, made possible through university inventions over in engineering, for a little background news. The station gives you a weather update, based on knowledge originating in the meteorological wings of universities. Then there are news stories about an earthquake that measured 7.5 on the Richter scale, the number of hurricanes predicted for this year, and the latest public opinion poll on the upcoming election, all of which are based on information learned through university research. You swallow the antibiotic your doctor prescribed for you, and then, as your conscience gets the better of you, decide to go out jogging. You bring along some Gatorade (another university invention) so you won’t get dehydrated. As you begin, you notice that your muscles are sore from your last run, and that reminds you to order some flowers for your elderly mother — her hip replacement surgery is tomorrow. On your way home you stop at the closest ATM for some cash, which, of course, uses another university discovery, and later, when you’re driving to work, you flip on the GPS to navigate a construction detour. A few minutes later, back on route, you use your E-ZPass to glide through the bridge toll booth — which uses laser technology, not to mention computers — paying a premium for driving into the city during peak hours (congestion pricing is also a university invention). Whatever your job, you are very likely to continue using methods and devices that are the fruits of university research once you reach the office. As the manager of a hedge fund, for example, you would be using sophisticated mathematical programs to help make investment decisions, and the mathematics and investment algorithms, of course, would be based on advances made in universities. When you entered the office, you would turn on the computer to find out how the foreign markets were doing. In fact, all day long you would be using the computer and the Internet, which also began with university discoveries. If your advertising agency was using focus groups, it would be basing its work on university research, and when you took your lunch break, and the clerk at the local deli swiped your sandwich and soda over the bar-code scanner, you would again be encountering a university discovery. Enough. The list could go on and on, but the point is clear. As we march through our daily lives, all of us are continually enjoying the benefits of discoveries made at our great universities. The universities play a huge role in bringing all of these inventions and discoveries into our daily lives, but they do not do it alone. The research conducted at our great universities is part of a larger national system of innovation. That system is essentially a social system for producing and applying new knowledge. It is a complex network of affiliations, collaborations, associations, and formal relationships that includes our universities, government agencies and laboratories, and the private sector, including the nonprofit research sector. Each plays a critical role in enhancing the overall stockpile of knowledge that we possess and in bringing it piece by piece into our lives through the practical applications that make up our world. Industry and research universities are interrelated in many ways — not only through licensing agreements (explored in Chapter 5), but also through production of the highly trained, talented individuals who work in industrial laboratories and through the founding of companies by university faculty or former students. As of 2003, over 70 percent of all science and engineering graduates were working in private industry. Forty-four percent of all the science and engineering students who had earned Ph.D.s were working in industry; 43 percent were working at institutions of higher learning; and 13 percent were doing other things. It is clear that research universities represent the main pipeline to our nation’s industrial research laboratories. And the 100 or so greatest research universities produce the majority of Ph.D.s in science and engineering. The great industrial laboratories could not function without these universities feeding them new, talented individuals on a consistent basis. Although the universities supply the talent — people with the aptitude, the skills, and the training to contribute to industry — as well as many of the ideas that industry uses, however, the credit for creating and developing products and services based on discoveries in science and engineering cannot go solely to the universities. Industry picks up where the universities leave off, playing an equal role in the innovation process. In that sense, there is a very productive partnership between the universities and industry. And the knowledge produced at universities and then developed by industry has huge societal payoffs with an enormous impact on local, national, and international communities. The national system of innovation in America has many components, as mentioned above. Here we will take a closer look at the relationship between two of those components — the universities and industry — with an emphasis on how the universities have an impact on the economies of their local communities. Stanford and Boston area universities, particularly MIT, have attempted to measure the economic and social impacts they have had on their local communities, and the data they have generated can help us estimate the impact of universities on local communities in general. Stanford University reported, for example, that since the founding of Hewlett-Packard in 1939, 2,325 members of the Stanford University community founded more than 2,454 companies. These companies included such giants as Cisco Systems, Google, Hewlett-Packard, Sun Microsystems, and Yahoo!, and their commercial prosperity led to the phenomenal success of nearby Silicon Valley. These companies have consistently made it into the “Silicon Valley 150” — the list of the largest Silicon Valley firms, published annually in the San Jose Mercury-News. In fact, they have not only made the list, they have consistently been in the top ten or fifteen in terms of rank by sales. In 2008, Hewlett-Packard topped the list, Cisco was number two, Google and Sun were numbers six and seven, respectively, and eBay was number nine, with Yahoo! twelfth. These companies generated $261.2 billion, or 55 percent of the total revenues of the 150 companies, in 2008. The total market capitalization of the Stanford-founded companies on this select list totaled $415 billion, or about 50 percent of the total market capitalization of the 150 companies. Silicon Valley is in a class of its own, but other cities have also benefited from their proximity to major research universities. A 1997 study by BankBoston concluded that the local economic impact of eight Boston-area universities was “more significant than at any other time in modern economic history.” The study concluded: “As jobs become more knowledge-driven, the universities produce not only the research that can lead to the creation of new companies and industries in the Greater Boston area, but the ability to deliver a workforce educated in emerging technologies.” It further noted that the universities had “served as a magnet to a number of national and international companies that have located or are developing major research operations in the Boston area,” listing Amgen, Cisco, Merck, Novartis, Pfizer, and Sun Microsystems as examples. A 2003 study of the economic effects of Boston’s eight research universities showed that in the year 2000, these universities provided a $7.4 billion boost to the regional economy. The universities employed almost 51,000 people directly in 2002 and provided employment indirectly for about 37,000 other workers in the region. (This does not include people employed by university-affiliated hospitals or research institutes.) A talent pool of roughly 32,000 graduates, many of whom remained in Boston, came out of the universities every year. 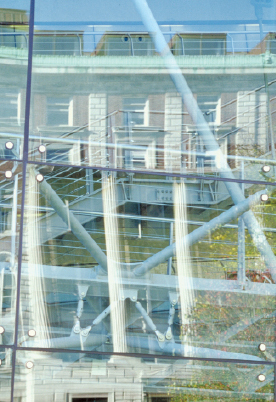 Innovative research at these universities had led to 264 patents, 280 commercial licenses for technology, and 41 start-up companies as well as opportunities for more than 25,000 continuing education students, many cultural and community events, and general improvements in the housing, streets, and environment of Boston. The universities received about $1.5 billion a year in research contracts and grants, mostly from the federal government. The report noted that faculty members had founded major local companies such as Akamai Technologies, Biogen, Delphi Communications Systems, and Genome Therapeutics. They had also spawned hundreds of new start-up companies. In fact, 25 out of the 50 Boston-area start-ups that had attracted the most financing had been companies associated with these universities. A 2003 study of the economic effects of Boston’s eight research universities showed that in the year 2000, these universities provided a $7.4 billion boost to the regional economy. The universities and the firms based on their research also were found to have a “multiplier effect” on the total number of jobs created in the local area because, for example, for every local job created by a pharmaceutical firm working on university-based discoveries, there tended to be three to five additional jobs created by the needs of that firm for suppliers of equipment and services. These data are now a decade old, but since 1997 MIT’s research and development activity and its role in the establishment of new start-up companies has expanded dramatically. The 1997 data vastly underestimate the impact of MIT’s faculty and students today on the formation of national and international companies and the value of their discoveries and innovations to our economic well-being. The fact that the universities have so strongly boosted the growth of technologically oriented firms is significant. The independent Milliken Institute in Santa Monica, California, found that it was the high-technology sectors of the economy that determined the success or failure of a metropolitan area. High-technology activity explained 65 percent of the difference in economic growth among metropolitan regions in the United States in the 1990s, and research centers and institutions were undisputedly the most important factor in incubating high-tech industries. Proximity to a research university has been a critical factor in determining where high- technology industries locate their offices and laboratories, both because the brains located at the university represent a greater asset than ever before, and because of the increased interest among universities to be involved in the early stages of company formation and the licensing of their ideas to established businesses. For many generations, we Americans have thought of education as a public as well as a private good. An investment in the education of our young people was an investment in the nation. We created land-grant colleges after the 1862 Morrill Act in an effort to train young people for more skilled jobs and to improve the quality of our agriculture and related industries through organized research. We knew that a better-educated citizen had greater life chances and could potentially contribute more to the general social welfare. In recent decades, we have moved away from this rationale for higher education toward one that focuses on individual payoffs rather than on larger societal returns. That is a mistake. Our personal and taxpayer investments in the American research university should be seen by each of us as an investment in the public good — in the larger welfare of the nation that will improve the lives of all citizens. That commitment to the general good is a fundamental part of the mission of great universities. The number of consulting firms that depend on advanced university training, either in the form of Ph.D. or advanced professional degrees, and that work for industry to solve market-research problems, is staggering. The very idea of systematic marketing research comes, as we shall see, from our universities. I don’t want to dismiss the other side of the story. The great transformation that university research has created in our lives and society, sometimes beyond what we could have imagined even a decade or two ago, also has produced a host of complex new scientific, moral, and ethical problems for us to address and solve. Our successes have spawned new dilemmas of choice. When modern biological science allows us to create new and potentially lethal viruses; when nanoscientists, piecing together individual atoms, can create biological structures that can learn from their own actions; when nuclear physics produces the possibility of Armageddon, and creates problems of nuclear waste disposal even when its discoveries are used peacefully to generate power; when computer-science technology allows us to spy on our own citizens and abridge their privacy; when automobiles and other manufactured goods contribute to global warming; and when we have the capacity to clone animals and potentially human beings, we are faced with a set of vexing and challenging problems of our own making that are sometimes urgent and often controversial. New social and economic costs are thus sometimes associated with discovery. A number of questions arise that we all must consider as the social and ethical impacts of university-related research affect our world in ever more surprising ways. When science and technology have the potential to be misused and can potentially fall into the wrong hands, what should our attitude toward the advance of knowledge be? When we can use our knowledge for the welfare of others, what choices are we faced with? How and whether we decide to use our knowledge depends on our values, and sometimes it involves making complicated choices where both options have advantages and disadvantages. These are issues that are usually the province of the humanities, not the sciences, and yet they are questions that scientists are now facing every day. This is why I insist that the great centers of higher learning must include an emphasis on the humanities and social sciences. Great universities cannot ignore the contributions of any of these sources of ideas. When we think about the contributions of the universities to industry we naturally focus on the influence they have had on the growth of industrial innovation and the scientific and engineering feats involved in taking ideas and translating them into useful products. But another kind of contribution to the social and cultural life of the nation is derived from the ideas, inventions, and discoveries made by scholars working in the social and behavioral sciences and the humanities. As with the contributions of science and technology to industry, the contributions in the social and behavioral sciences and the humanities are made through the influence of ideas, concepts, and methods as well as through the people who establish and staff organizations and businesses that depend on the training that is provided in these fields by our best universities. Consider in blueprint form five domains where our universities have had an enormous impact on the direction the society has taken over the past fifty years: (1) independent “think tanks” that translate empirical knowledge into policy advice; (2) consulting firms that are used by businesses and government to solve organizational problems; (3) nongovernment organizations around the world and other private nonprofit foundations; (4) cultural institutions; and (5) individual social and political advisers who work for the government. There are hundreds of thousands, if not millions, of jobs created as well as thousands of businesses spawned as a result of the training and expertise gained at our universities in these fields. There are hundreds of private think tanks, and they work on every imaginable subject, from military preparedness to health-care reform. Some are liberal (the Brookings Institution), and some are highly conservative (the Heritage Foundation), but the entire spectrum of political perspectives is represented in the range of think tanks that exist. Though most are independent, some are associated with universities (such as Stanford’s Hoover Institution, the University of Chicago’s National Opinion Research Center [NORC], and the University of Michigan’s Institute for Social Research [ISR]). Some are extremely large, such as the Rand Corporation, while others are boutique-sized, specializing in just a few areas of knowledge. What almost all have in common is that they recruit highly knowledgeable and well-trained graduates of our major research universities, most of them with advanced degrees from Ph.D. programs or law schools. Many of the larger think tanks have endowments, but their revenues come principally from work on government contracts that require specific answers to questions posed by the funding agency or from private businesses. They exert increasing amounts of influence in the policymaking world, independent of universities. The quality of their work is often mixed, but they depend largely on our great universities for their talent. The Graduate School of Journalism, which has educated many of the world’s best journalists, is reflected in the windows of Alfred Lerner Hall, the undergraduate student center. The number of consulting firms that depend on advanced university training, either in the form of Ph.D. or advanced professional degrees, and that work for industry to solve market-research problems, is staggering. The very idea of systematic marketing research comes, as we shall see, from our universities. Polling and public-opinion firms alone hire thousands of people to staff their efforts to put their finger on the pulse of the nation. Hundreds of thousands of jobs have been created from the ideas and methodologies developed at research universities that have created advanced techniques to explore questions about peoples’ preferences and purchasing behavior, and about their attitudes and opinions, and to place these views in some form of theoretical context. Nonprofit organizations are largely staffed by those with advanced training at our great institutions of higher learning. Nongovernment organizations (NGOs), which now number in the thousands around the world, and which set out to achieve a host of objectives, ranging from empowering women in less developed countries to preventing disease, find their talent most often at the distinguished research universities. These graduates of our universities are contributing on the homefront as well as epidemiologists working for the Centers for Disease Control; they might become medical sleuths trying to uncover the genetic makeup of a bacteria or to piece together the history of a flu that is developing into a pandemic. As social workers with Ph.D.s or lawyers who work for organizations such as the Urban Justice Center, they may advocate for the poor. Brilliantly trained lawyers and Ph.D.s are working for organizations that are trying to limit the number of wrongful convictions in felony cases through the use and analysis of DNA evidence. In today’s world, NGOs are having as much impact in many domains as governments are. And large, private foundations that support the arts, sciences, and humanities, as well as ongoing projects on themes designed to address major social, political, and economic problems, also depend increasingly on the skills and knowledge of Ph.D. and professional school graduates from our finest universities. Foundation leaders and program officers, who choose how and where to invest scarce resources, have been trained and often had teaching or research experience at these universities. Finally, we should not omit the contributions of these universities to the cultural institutions of our cities and nation. Universities produce more doctorates than are needed on university faculties. Increasingly, these highly trained professionals, particularly in the humanities, are working at museums, libraries, media companies, and arts and cultural centers. The quality of curatorial work at museums, and the art and science of the restoration and preservation of valuable artifacts, depends on highly technical knowledge that can only be gained with advanced education. Work at museums on virtual learning centers and on documentary films exploring historical and cultural subjects depends on the talents emerging from the advanced university programs…. As we depend increasingly on knowledge as the source of social and economic advance, we require an increasing proportion of our young people to be trained, even beyond their undergraduate education. The universities are not only critically important to our economic and technical welfare; they are also, both directly and indirectly, essential in creating the richness of the social fabric of the nation. 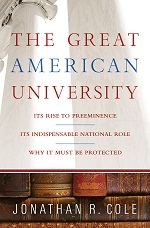 Excerpted with permission from The Great American University: Its Rise to Preeminence, Its Indispensable National Role, Why It Must Be Protected by Jonathan R. Cole (PublicAffairs, 2010).